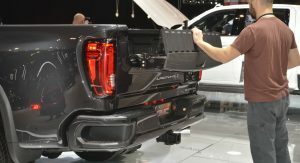 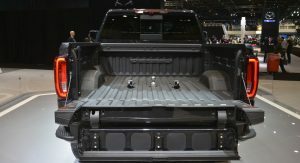 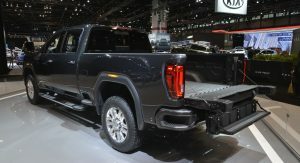 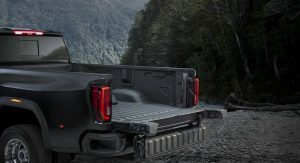 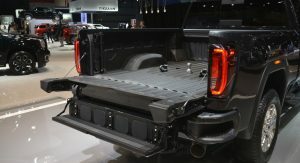 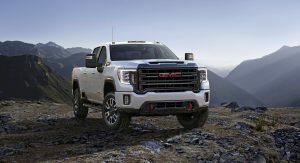 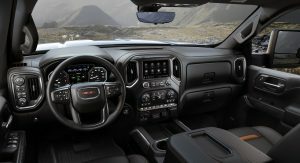 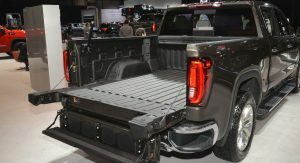 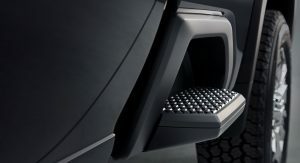 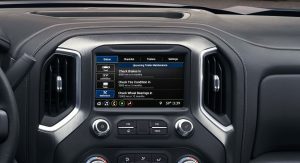 The 2020 GMC Sierra HD pickup is equipped with one of the most useful technologies you could ever wish for in a heavy duty pickup truck, specifically the ProGrade Trailering System. 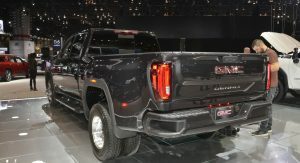 On display at the 2019 Chicago Auto Show, the new Sierra HD boasts a redesigned exterior with a massive front grille, new headlights, LED fog lamps and more. 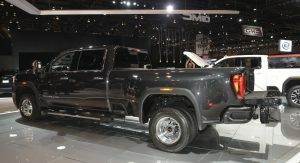 Compared to the previous model, the new Sierra is both longer and taller. 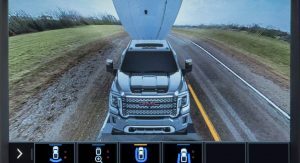 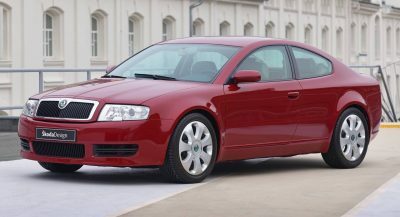 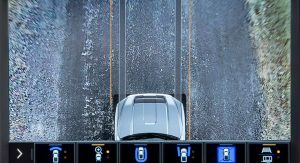 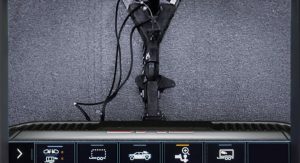 Also new are technologies such as the Auto Electric Park Brake, Park Grade Hold Assist, Integrated trailer brake controller, Hill Start Assist, Hill Descent Control, Trailer Sway Control, Auto Grade Braking, Diesel Exhaust Braking and a Tow/Haul mode. 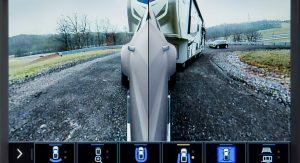 Even with all these goodies onboard, it’s the ProGrade Trailering System that impresses most. 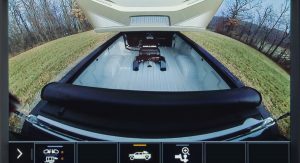 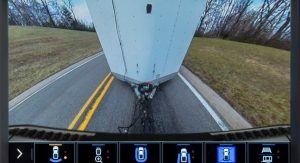 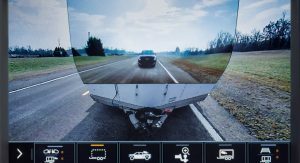 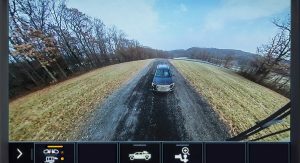 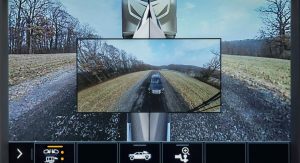 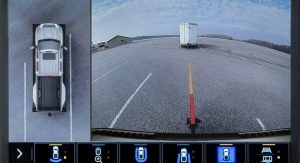 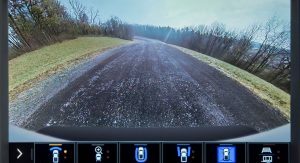 It gives the driver access to 15 different camera views, including one that basically makes the trailer transparent. 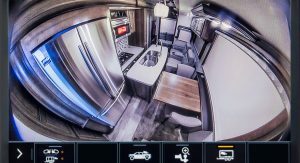 It also offers features like the Trailer Light Test, Trailer Electrical Diagnostics, Trailer Tire Pressure and Temperature Monitoring, Pre-Maintenance Preminders and a Departure Checklist. 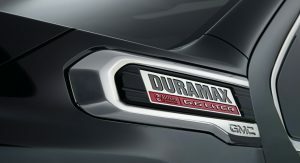 Powering all 2020 GMC Sierra HD models is a 6.6-liter turbo-diesel Duramax engine, producing 445 HP (451 PS) and 910 lb-ft (1,233 Nm) of torque. 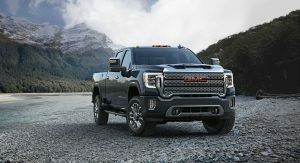 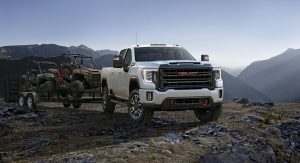 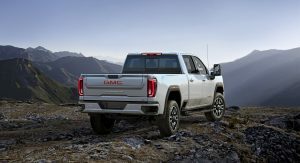 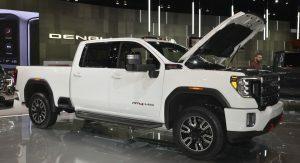 GMC says that it can tow in excess of 30,000 lbs (13,607 kg), which may be less than the 2020 Silverado HD’s official towing rating of 35,500 lbs (16,102 kg), but it’s impressive nonetheless. 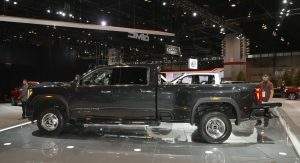 The U.S. automaker also brought the off-road focused Sierra AT4 HD to Chicago, boasting a number of dark chrome exterior highlights, as well as bespoke front and rear bumpers, textured aluminum finishes, Jet Black trim for the interior, leather seats and embroidered AT4 badges for the headrests. 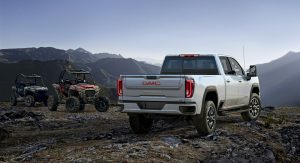 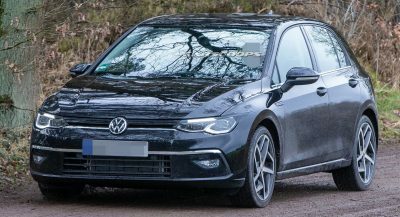 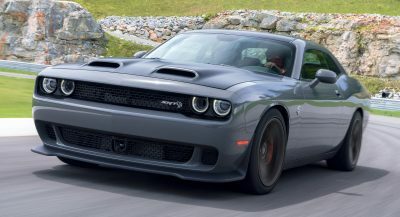 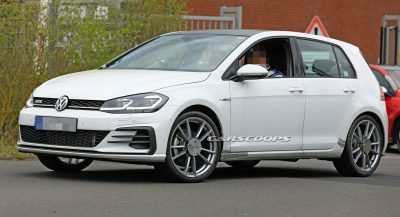 Other features include the off-road tuned suspension, bespoke 18-inch wheels, a 15-inch Head-Up Display and an Off-Road mode for the Traction Select System. 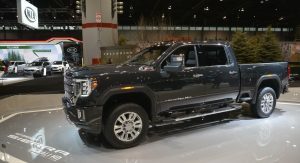 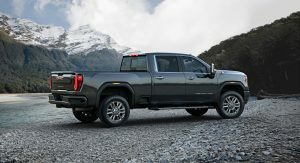 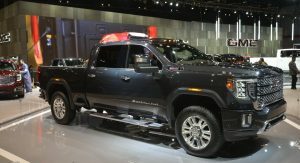 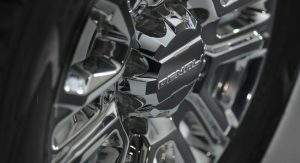 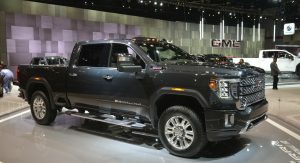 Sales for all 2020 Sierra HD models will commence later this year, with pricing to be announced at a later date. 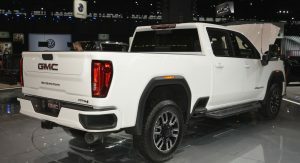 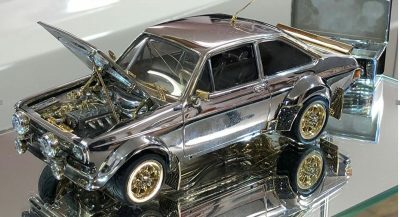 The outside of this looks fantastic, but the dash looks like a 1980’s Sony Boombox. 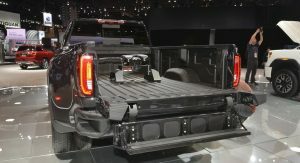 “1980’s Sony Boombox.” Nailed it. 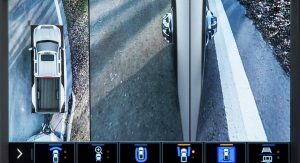 You’ll be disgusted when you see it and touch it in person – so sad. 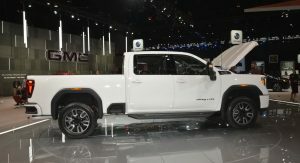 I went to LA and saw it. 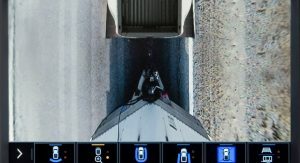 It was very disgusting. 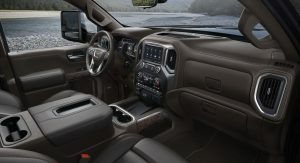 Interior wise Ram has it beat. 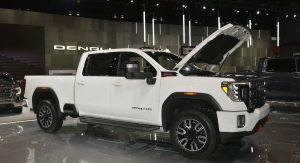 I agree – I went to the Detroit show and was dismayed.